LEADER is a European funding programme for the development of rural areas, which engages local actors in designing their regions under the European Common Agricultural Policy. The underlying approach of the European Union is to transfer, to rural areas, more responsibility for their own development. The hub of the LEADER regions is the local action group (LAG) in which actors from all sectors (industry, agricultural, municipalities, welfare, politics, associations, cultural organisations etc.) collectively draw up a development concept for their region and select and support suitable, innovative and model projects. Just about anything is possible in LEADER projects which include activities ranging from the experimental cultivation of new fruit varieties to the setting up of a citizen’s meeting place, from canoe hire to signposting for mountain bikes, from municipal forest kindergartens to sculpture trails, from language courses for refugees to energy production from pomace. Of key importance is that a project starts at grass-roots level and is a benefit to the region. In the LEADER programme, great importance is attached to inter-territorial cooperation and the development of transnational projects. 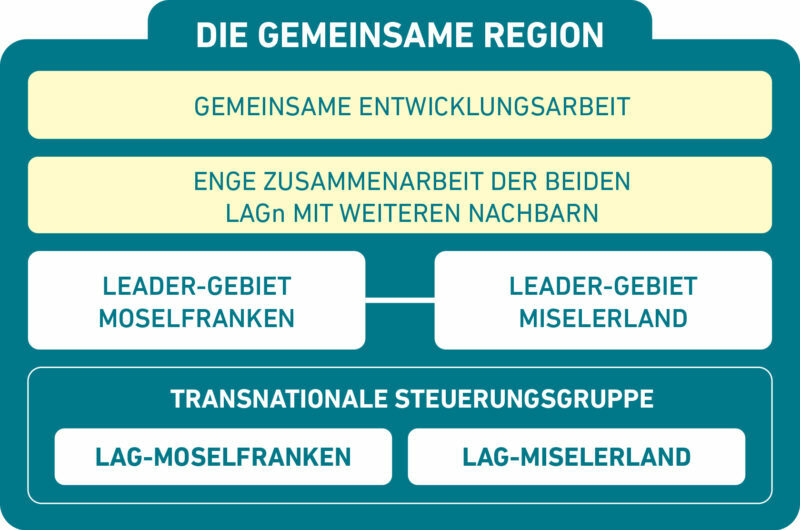 The first transnational LEADER region in Europe is situated to the east and west of the Moselle river in the direct vicinity of the LEADER area of Miselerland in Luxembourg and the German LEADER area of Moselle-Franconia at the heart of the border triangle and at the centre of the wider region of Saar-Lor-Lux-Rhineland-Palatinate-Wallonia between the cities of Luxembourg and Trier. These two regions form the first transnational LEADER region in Europe. The Rhineland-Palatinate LEADER region of Moselle-Franconia is made up of the three collective municipalities of Konz, Saarburg and Trier-Land in the district of Trier-Saarburg while the Luxembourgish LEADER region of Miselerland consists of l4 municipalities in the two East Cantons of Remich and Grevenmacher. 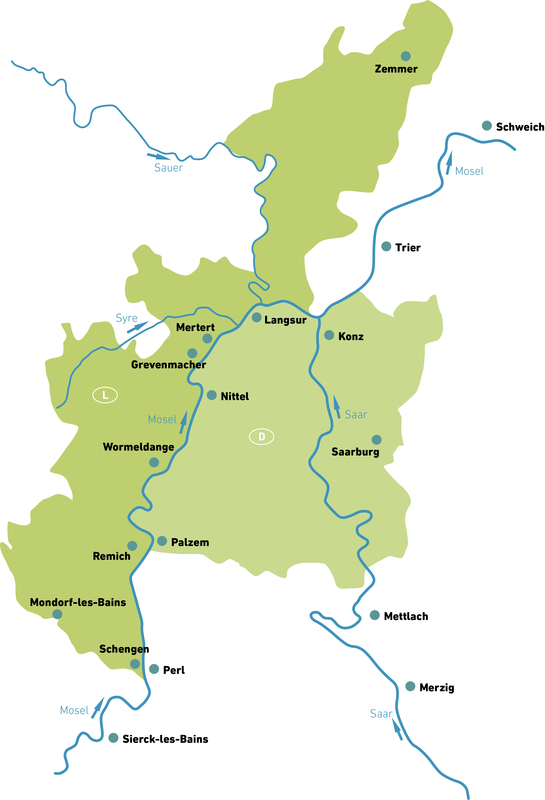 The joint cultural landscape is characterised by the rivers Moselle, Saar, Sauer, Kyll and Syre, and particularly by viniculture and fruit-growing. The Romans, Celts and Franks have left their marks everywhere. The two dominant economic centres in the region are Trier and Luxembourg while wine-growing, agriculture, tourism, commerce and skilled trades are the main industrial sectors. Social development is similar in both these LEADER areas: an influx region with great appeal, it shows high rates of population growth. This results in social challenges, the like of which are rare in other areas of Luxembourg and Rhineland-Palatinate and which Miselerland and Moselle-Franconia would now like to tackle in close cooperation. 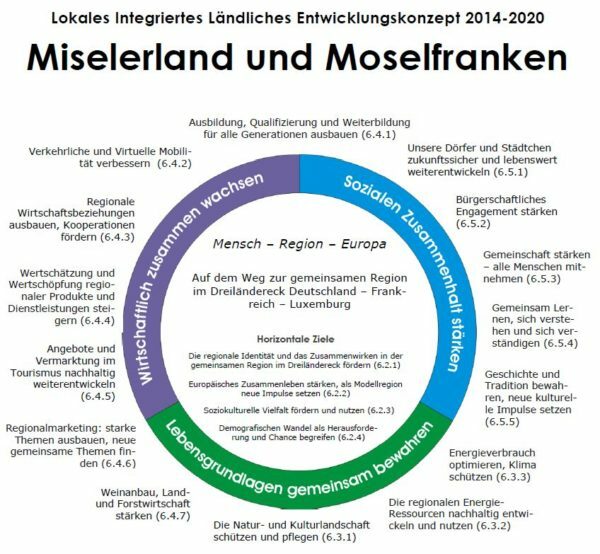 Since the local action groups (LAG), regrettably, do not have an EU statute under the LEADER programme and each LAG can only apply for funding in one country where its region is situated, Moselle-Franconia and Miselerland will continue to exist as two LAGs. A transnational steering group is coordinating the cross-border cooperation. 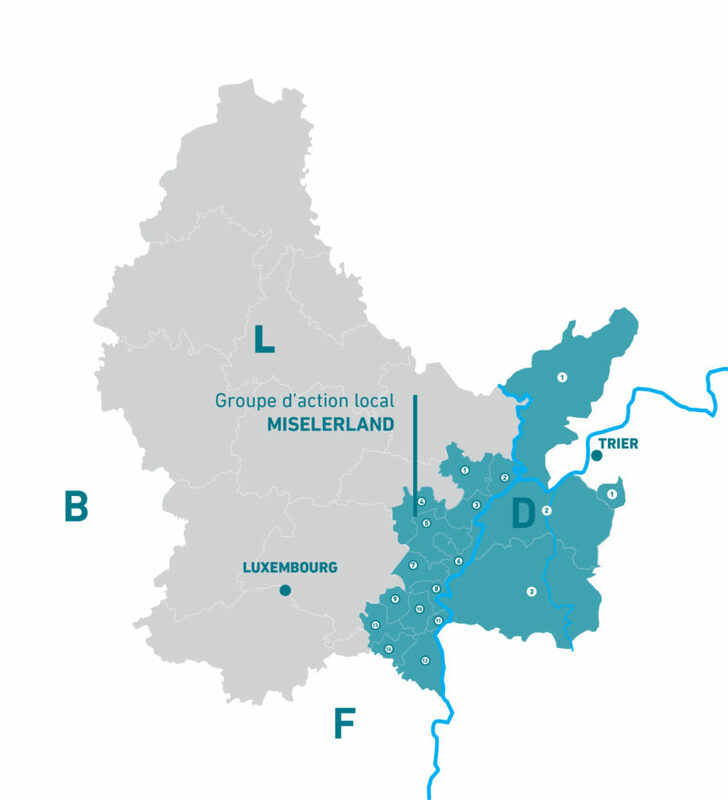 For many years now, the people in the two LEADER regions of Moselle-Franconia and Miselerland have maintained a wide range of connections and a lively exchange of information across national borders. In order to support, foster and design this close cooperation more transparently, the responsible parties in the two LEADER groups have decided to enhance neighbourly relations in the communal region by implementing a joint, transnational LEADER development strategy, the first of its kind across Europe, in the hope of adopting a trailblazing role for many other border areas in the EU. on the way towards a communal region in the border triangle of Luxembourg, Germany and France. The development strategy, which is divided into three major areas of activity based on the three pillars of sustainability (industry, environment, people) consists of 15 regional objectives and a total of 70 sets of measures that were drawn up from the needs of the transnational region that were identified using an analysis of strengths and weaknesses as well as experiences from previous funding periods. On a horizontal level, there are 4 objectives with 17 sets of measures that should be considered as a priority in project concepts and selection. Stakeholders from public administration, industry and commerce, social services and civil society have come together in the local action group (LAG) to draw up a development strategy for the region which can be used to draft projects or to support third-party projects. This group forms the decision-making committee for the selection of individual projects for funding. 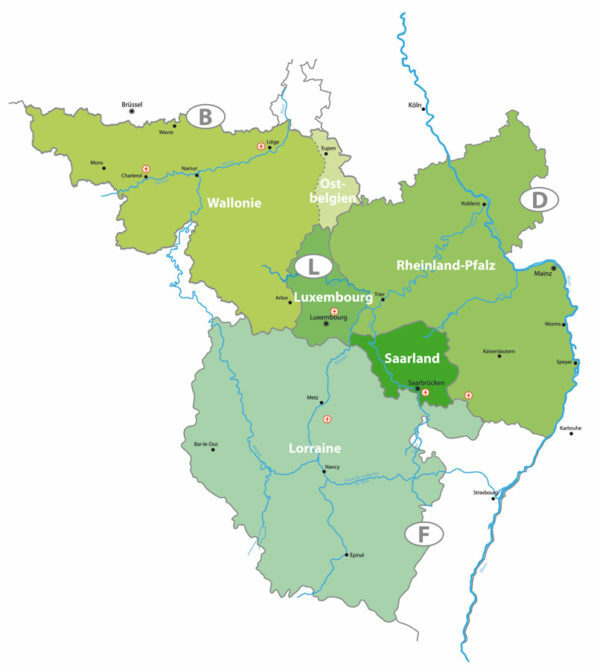 Set up in 2003, the local action group LEADER Miselerland, with its 48 members from 14 municipalities and 34 organisations from all sectors of society, reflects the make-up of the region. In order to provide the framework for supporting and implementing a variety of projects, the LAG works out a regional development strategy that is adjusted every 7 years to accommodate social developments. To this end, its members convene four times per year to discuss project concepts and proposals. The LAG’s work and organisation are governed by an agreement . Reports are written on every LAG meeting. The amount of funding depends on the dimension of a project and can be as much as 100%. The European Agricultural Fund, the Luxembourgish Ministry of Agriculture and the municipalities in the region contribute one-third of the funding amount respectively. Cooperation between the Ministry of Agriculture and the LAG Miselerland is governed by an agreement. LEADER local action groups (LAGs) are made up of public and private stakeholders in the region who support projects under the LEADER approach for the EU funding programme EAFRD.